The Little Old Lady needed to live somewhere, why not Hellam, PA? 25 feet high containing 5 stories with a matching doghouse and mailbox. 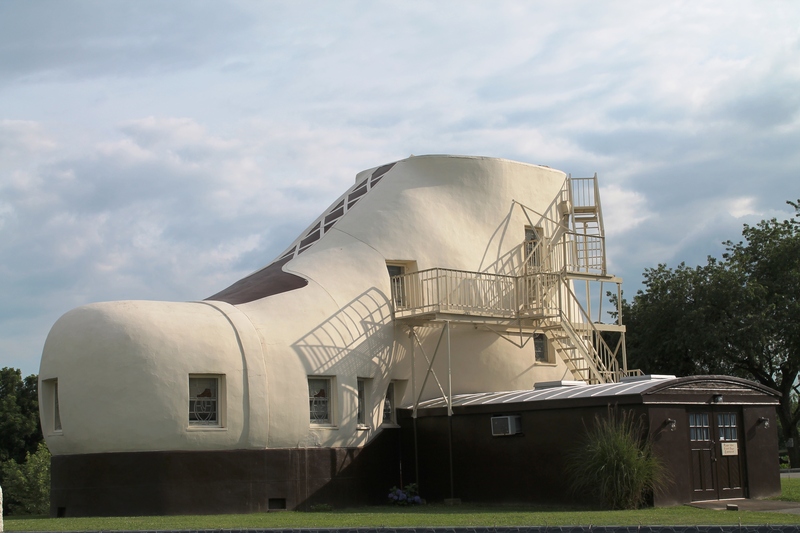 Modeled after a work boot, the house was built by shoe salesman Mahlon Haines in 1948 as a form of advertisement. There is also a stained glass panel that shows Mahlon holding a pair of shoes with a message below it that reads, “Haines the Shoe Wizard” and additional windows featuring a boot. He lived in the shoe house for a short while but ended up moving into a house across the street. The renters were served by a maid and butler and then received free pairs of shoes when they left. The current owners are Carleen and Ronald Farabaugh who bought the house in 2004. The house received a small renovation and new paint in 2007. The Shoe House was visited in the 8th season of the reality television series The Amazing Race and was featured on HGTV‘s What’s With That House.